This past weekend on my webcast, I had so much fun playing with new stamps from Mark Montano for Craffiti Direct and new stencils from Rebekah Meier for Crafter's Workshop. Click here to watch the full 30+ minute webcast or watch the highlights at the bottom of this post. 1. Stamp the medium-size lion tamer image on the ATC three times - start with the lightest ink color on the left and graduate to the darkest on the right. Let dry. 2. Trim the matting papers as desired and color the edges with the black marker. 3. Layer and adhere the ATC with the matting papers on the front of the square card as shown. Add a decorative embellishment in the corner. 1. Hold the stencil in place on top of the watercolor paper and dab the rose inkpad generously. Heat-set with heat gun and trim out to 6-1/2" square. 2. Place stenciled design on a cutting mat and punch holes to accent the design as desired. Tape craft foil behind it so the gold peeks through the holes. 3. Stamp the lion tamer in the lower right corner on top of the stencil design with clear ink. Quickly sprinkle embossing powder on top and tap off excess. 4. Carefully brush away the powder from the shadow areas of the stamp, then heat-set the image. 5. Repeat steps 3-4 on white cardstock, then trim out the image. Adhere in front of the first image with foam pads. 6. Color the edges with the gold marker and adhere to a larger square of black cardstock. This week on my Creative Space column, I featured a super quick and easy design for making springtime greeting cards. Even if you've never made one before, handmade greeting cards are really special, your friends and family will love getting them! Click here for instructions. Click here to read my earlier Creative Space posts on the Claycord.com blog. If you live in the San Francisco Bay Area, I list lots of great creative events happening in and around Concord every week - art shows, craft fairs, concert, performances and more. Check it out! This past Saturday on my webcast, I shared a mixed media technique I learned from a demo at my local artists group, then I added a little of my own flair...here's the finished seahorse that I started during the webcast. Click here to watch the full 30-minute show or watch the highlights below. Click here to download the project tutorial as a PDF. 1. Adhere the tissue to the watercolor paper by brushing Mod Podge (thin first with a little water), above and beneath the tissue, brushing creases and wrinkles into it as you go. Let dry. 2. Paint a pale background on top with watercolors - I used blues and purples. Use less water for richer colors. Let dry. 3. Use a pastel pencil to trace a seahorse from a royalty-free image printed from your computer on to parchment paper, then flip it over and transfer the seahorse to the watercolor paper by rubbing the tracing with a craft stick. 4. Stamp a random pattern around the seahorse – I stamped little circles to look like bubbles. 5. Color in the seahorse with pastel pencils. I used my finger to blend blue, green, purple and yellow together. 6. Rub some PanPastel color over the surface to accentuate the wrinkles. Spritz lightly with a pastel fixative. Let dry. 7. Highlight all or part of the seahorse with Dimensional Magic. I left random open streaks on his belly. Sprinkle clear glitter on top and let dry, then brush off any excess glitter. This week I want to show you a cool mixed media technique - using gift tissue to create a wrinkled background for a drawing or painting. I learned it recently from Nancy Mathews, a local artist and teacher who demonstrated at our art association meeting. Join me for my live weekly webcast! Tomorrow - Saturday, March 22 at 10:00am PT (1:00pm ET). Click here to enter the webcast room at showtime - we're gonna have some fun and we're gonna get messy! This project involves lots of drying time, so I'll be using step-outs. That means crafting along won't be possible - but I'll post a full tutorial and supply list here on the blog next week, along with the replay link, if you can't make the live webcast. Click here for more details on how the webcast works - hope to see you tomorrow! My friend Ann Butler recently came out with a line of rubber stamps and some yummy ink pad colors and she was kind enough to send me some. I really love the purple and the lime green together, especially in a distressed kinda way. First I smudged both colors on white cardstock with a cosmetic sponge, then I stamped the purple circles. I used one of Ann's faux quilting stamps to stamp and heat emboss white polka dots on top. A little hemp cord and a charm and done! Today on my webcast, I showed how to create a "broken glass" mosaic panel with alcohol inks, glitter and acetate - perfect for a greeting card. The technique was inspired by a mosaic project in Andrea and Cliff's new book - The Crafter's Book of Clever Ideas. We gave away a copy of the book during the live webcast and we have another copy to give away right now! To enter, just leave a comment here on this post by April 10, 2014. Click here for a list of more designers who are giving away a copy too - lots of chances to win! Click here to watch the full 30 minute webcast replay or watch the highlights below. Click here to download the project instructions. Saturdays with Lisa webcast - my special guest is Andrea Currie! Join me for my first episode of Saturdays with Lisa - this Saturday, March 15th at 10:00am PT (1:00pm ET) - just click here at showtime to enter the webcast room. There will be crafting with friends, there will be chatting with friends, there will be goofing off and joking around with...yep, friends! Click here for more details on how watching the webcast online works. 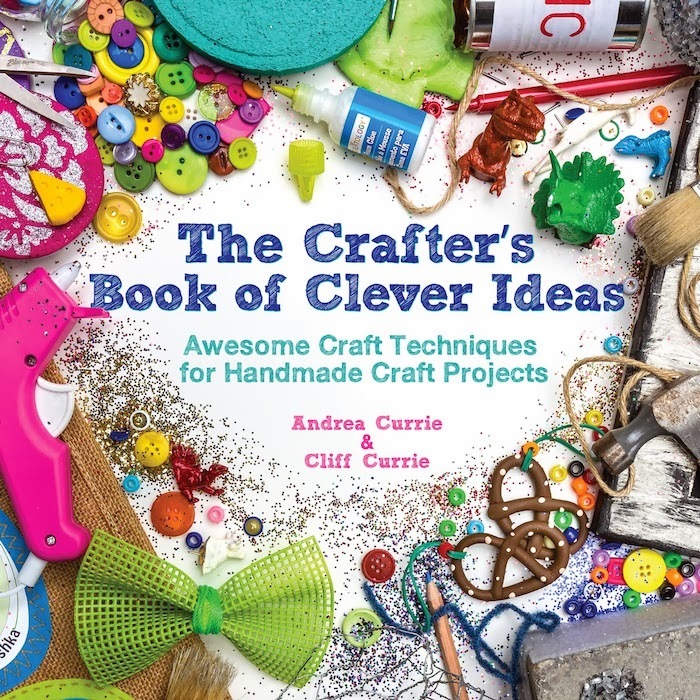 My special guest is Andrea Currie - she and her husband Cliff are the authors of a new book, The Crafter's Book of Clever Ideas - and she's also my crafty sistah! You might remember watching us craft our way to a glittery $10,000 prize on the "Alter or Falter" episode of Craft Wars a couple years ago. Andrea will share some glitter love, talk about their exciting blog tour for the book, and maybe even give us a little demo. Then I will show you a super fun way to make a "broken glass" mosaic greeting card, using a project in their book as inspiration. See the supply list below if you want to craft along with me! If you're in the room during the live webcast, you'll have a chance to win your own copy of Andrea and Cliff's awesome book! It's full of whimsical projects that are fun for gifts and parties, with a little "his and hers" twist. Every episode of Saturdays with Lisa will be recorded, so if you can't make it to the live show, I'll be posting the replay links here on the blog. March is here and crafting is in the air! Recently my friend Kathy suggested to several of us craft industry designers that we should celebrate National Craft Month by writing a post about why we craft. I have met so many awesome people in the greater crafting community, from home hobbyists to industry professionals. Everyone is so supportive and there's just this instant bond between us glitter-n-glue-n-paper-n-fabric-n-stamp-n-paint lovers. There is so much variety in crafting - really, there's something for everyone and there are lots of great how-to books, videos and webcasts to help me try something new and get my craft on. Whether I'm making things for myself, my home, my family or friends, it's so refreshing to get away from the malls and all the mass-produced crap and immerse myself in some quality DIY time. I just feel better when I'm being creative, my right brain digs all the attention. I love, love, love to spend time imagining and designing - it does a great job of chasing away the blues, too. Nothing melts away the troubles of my day like painting a box, playing with pretty papers and fabrics, doodling with fancy pens, or any number of repetitive crafts like kumihimo, needlefelting or embroidery. There's no crying in crafting! For reals, even when I screw it up, it's not the end of the world. A craft fail can be totally hilarious and tweetworthy. Plus it's true what they say, every mistake is a design opportunity. Crafters are just so damn generous - from random acts of kindness to paying it forward, we share our stash, our ideas, our inspiration, our skills and our links to each other's work. Crafting can be wonderfully communal as well as fun for flying solo. I love crafting in groups and classes just as much as working alone in my studio. Those who can, craft. Those who craft, teach. I love demonstrating and teaching, as do so many of my fellow crafters. I love it when someone gets excited about trying a product or technique I show them, and it's even better when they feel inspired enough to want to put their own spin on it. I'm a huge shortcut queen, I have very little patience for perfection or following patterns to a tee. I tend to design as I go, cover up boo-boos with buttons and bling, and just run wild with a new technique - and those are all excellent qualities in crafting! So go out there and enjoy National Craft Month - it's a great time to enter a craft contest, find some new blogs and Pinterest boards, and try some new crafts! And don't forget to add #Cre8time to all your crafty social media posts to share the love. Today on Creative Space, it's all about the Concord Art Association - a lovely group of over 70 local artists. Check out the art associations in your area! 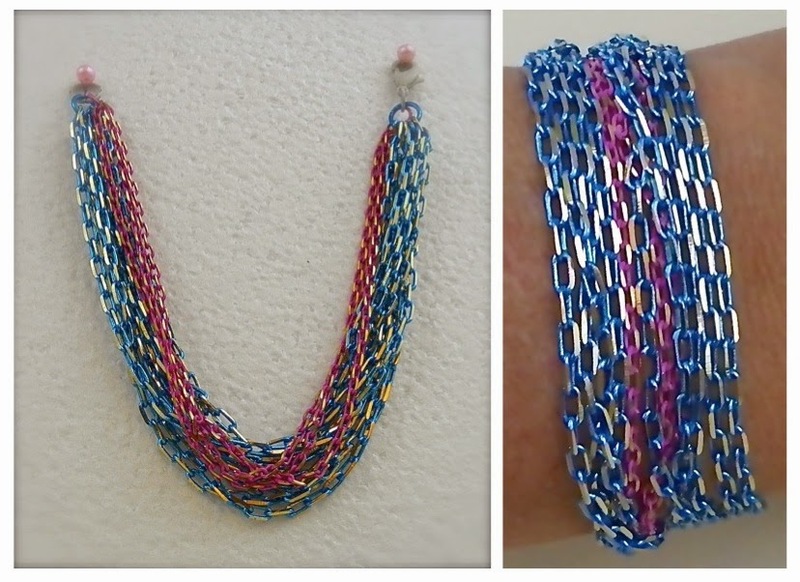 It's the first Monday of the month - time for some blog-hoppin' with the Designer Crafts Connection! This month our theme is "ideas that blew me away." You know, because March is windy and all? Of course making pom-poms and tassels are time-honored crafts, but I really was blown away by how easy and fun it is to make them with these tools from Pattiewack Designs. Pattie is now making and selling her pom-pom and tassel tools under her own name, and she sent me a set to try. I used some variegated yarn to make this 3" pom-pom and then I attached a 4" tassel. I didn't make it too full or trim it too evenly on purpose, I really like how all the different colors look together when it's a bit scraggly. The pom-pom tool (left) comes in two sizes; with both tools you can make pom-poms from 1/2" up to 5" wide. With the tassel tools (right), you can make tassels from 1-1/2" up to 7" long. These tools can be purchased on the Pattiewack site. I've been playing with string, twine, yarn and ribbon - the tools definitely make the process quick and easy and I've made some super cute pom-poms and tassels! I only had a wee bit of trouble trying to make a wee bittie 1/2" pom-pom with string. I think I wound too much string around the tool and I couldn't quite tie the anchor string tight enough. So I'm going to try again with a little less winding and I'll use some wire to twist around the middle instead. And for a super cool bonus, this close-up shot of my variegated yarn pom-pom is fantastic color and texture inspiration for my next mixed media painting! 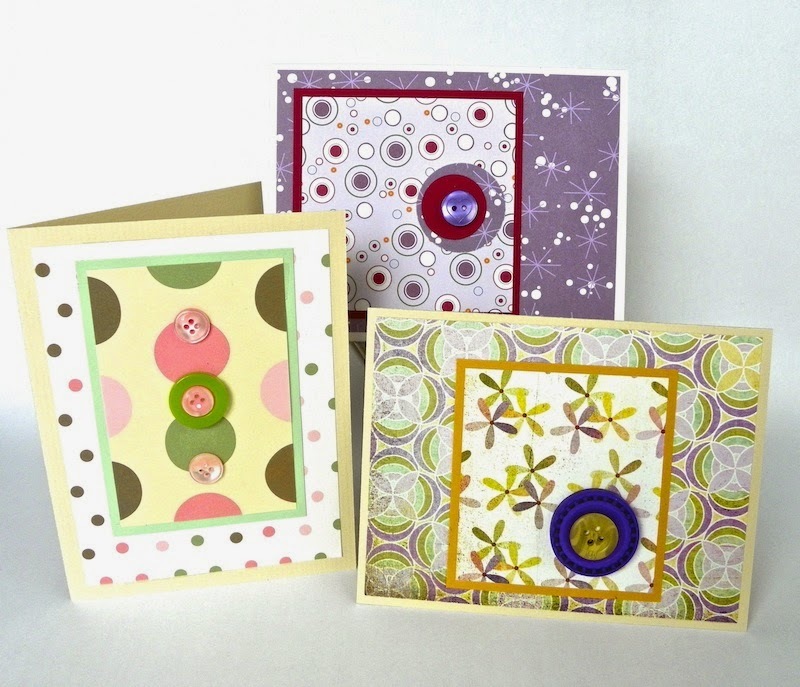 To visit the other Designer Crafts Connection blogs, click one of the hop buttons in the DCC logo on my sidebar. Look for this same logo in each blog's sidebar to move yourself along. Enjoy!